Hi everybody, it's Lithium Flower here! 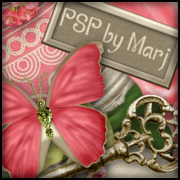 My dear friend and owner of this site, Marj, passed away a few years ago. She is dearly missed in the PSP community. It has taken me this long to be able to get in here and write this, but I can finally tell you all that this site will remain open in memory of Marj. and I'll do my best to try to sort it. I will leave the site as is and there will be no new tutorials posted here. ​Thanks for understanding and for stopping by here. ALL tutorials on this site were written by myself, Marj. Resemblances to any other tutorials are purely coincidental. You MAY link to my tutorials, use for group challenges and share with friends. You May NOT copy and paste any part of my tutorial onto another site. Use the results from my tutorials for any monetary gain or claim tutorials as your own. All my templates are in P.S.D format. This is a 100% copyright compliant website, and this award from The Zone Groups is only awarded to PSP sites showing dedication to upholding copyright compliance. Click on the award to go to The Zone Groups.